MINNEAPOLIS--(BUSINESS WIRE)--Feb. 24, 2014-- Delivering on its commitment to offer innovative products at every price point, SLEEP NUMBER today announced all new Classic Series beds and FlexFit™ adjustable bases. The latest innovations from Sleep Number bring several of the company's most advanced consumer benefits to its opening price point beds, which were recently launched in its premier x12 bed with SleepIQ™ technology. Select models in the Classic Series offer enhanced comfort and support, and now feature the company's most advanced adjustable dual-air-chamber technology combined with a patented Edge-to-Edge™ design for $1,499.98 for a queen bed set. A patented FlexTop™ mattress design option is now available on any king-sized Sleep Number® mattress, so each individual can raise the top half of their side of the bed independent of their partner's side while sleeping together in the same bed without separation. Sleep Number also introduced new FlexFit adjustable bases starting at $1,199.99 that can be added to any Sleep Number® bed. The FlexFit series offers features such as a snore button to help temporarily alleviate a partner's common mild snoring. "We believe our proprietary, benefit-driven products help people achieve the best sleep of their lives, and that's why we're committed to bringing those innovations to everyone—at all price points. We want everyone to know better sleep," said Annie Bloomquist, chief product officer, Sleep Number. "Our rigorous product development and testing process indicate that we have improved our Classic Series mattresses by designing a more comfortable sleep surface. For example, our enhanced c4 and c3 bed design improves comfort and reduces sleep-impeding pressure points so customers can experience a great night's sleep." A 3-zone comfort layer that provides soft support, and contours and cushions the head, back and hips for improved comfort. Additionally, the c4 bed has a plush softness and a breathable knit fabric for a comfortable night's sleep. Featuring the classic DualAir technology, the redesigned Sleep Number® c2 bed has a premium, aesthetic design. The Classic Series is comfortably priced so consumers can know better sleep with mattresses starting at $699.99. Couples no longer need to combine two twin beds in order to have limitless adjustability options; Sleep Number's new mattress design, coupled with its adjustable base options, offer the ultimate in adjustable comfort. The patented FlexTop mattress allows each person to adjust the top half of their side of the bed independent of their partner's, and still experience the feeling of togetherness on the same mattress. It's a great solution for couples who relax in bed together; now one partner can elevate their head to read, watch TV or surf the web while their partner sleeps comfortably in a flat position. 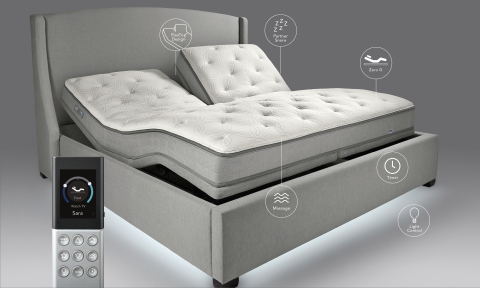 Originally introduced on the x12 bed, the FlexTop mattress is available on any king-sized Sleep Number mattress. Consumers can read, watch TV and surf the web in bed in ultimate comfort with the exclusive FlexFit adjustable bases starting at $1,199.99. The new bases include choices the consumer will love, such as a Partner Snore™ feature on the FlexFit™ 2 and 3, or the ability to control the nightstand lamps and soft, under-bed lighting on the FlexFit 3 so customers are never left in the dark. "The combination of the FlexTop mattress and the FlexFit adjustable base offers the ultimate in Sleep Number comfort and adjustability at a meaningful opening price point," Bloomquist said. "And since snoring is such a common consumer concern, we have an adjustment for that if you or your partner are a mild snorer." Designed around customers' unique sleep preferences, high-quality Sleep Number beds have improved more than 8 million lives. Unlike other mattresses that feature foam or springs inside, only the Sleep Number bed has Sleep Number DualAir technology inside, which allows couples to adjust each side to their individual comfort and support at the touch of a button. Each Sleep Number bed comes with a 100-night in-home trial and a 25-year limited warranty. Sleep Number also offers a complete, exclusive line of innovative sleep products designed to meet every individual's needs. From the AirFit™ adjustable pillow that adjusts for cradling comfort, to the DualTemp™ layer that uses proprietary active air technology to heat and cool each side and works with any mattress brand, Sleep Number offers exclusive solutions designed to improve sleep. Select Comfort Corporation is leading the industry in delivering an unparalleled sleep experience by offering consumers high-quality, innovative and individualized sleep solutions and services, which include a complete line of SLEEP NUMBER® beds and bedding. The company is the exclusive manufacturer, marketer, retailer and servicer of the revolutionary Sleep Number bed, which allows individuals to adjust the firmness and support of each side at the touch of a button. The company offers further individualization through its solutions-focused line of Sleep Number® pillows, sheets and other bedding products. And as the only national specialty-mattress retailer, consumers can take advantage of an enhanced mattress-buying experience at one of the 440 Sleep Number® stores across the country, online at www.sleepnumber.com or via phone at (800) Sleep Number or (800) 753-3768.